Discover our fantastic selection of Fish Recipes and Cooking Ideas all written by our expert professional chefs at L'atelier des Chefs, based in London. 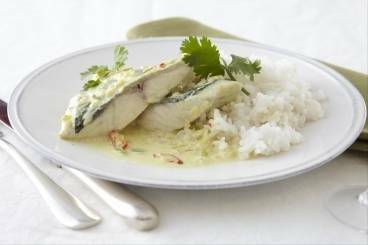 An Indonesian curry made with fresh sea bream, coconut milk, chilli and lemongrass. Easy to prepare Thai fish cakes served with sweet and sour dipping sauce. Authentic fish curry cooked with an traditional spice blend from the south of India. Fish pieces cooked in a white sauce with spinach and boiled egg topped with mashed potato. Serve with a crisp salad for a tasty supper. Cod, salmon and pollack poached in a white cream sauce and topped with crisp, home made shortcrust pastry. Serve with a watercress salad for a great evening meal. 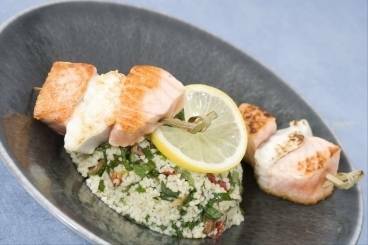 A tomato, mint and parsley cous cous salad topped with skewers of grilled salmon and cod. Crunchy pieces of pollack served with home made mushy peas and tartar sauce in a warm ciabatta sandwich. A quick and easy Spanish stew made with cod, prawns, chick peas, potatoes, tomatoes and parsley. Perfect served for lunch or supper. Poached salmon and cod in a white sauce with basil infused mash potato and sprouting broccoli. A Moroccan flavoured fish cake served with a spicy tomato sauce.